As a former pediatrician in rural Vermont and a career-long believer in the centrality of primary care, I have been frustrated and dismayed to witness the lack of definitive evidence demonstrating what is considered to be conventional wisdom—that a high-performing health system must have primary care at its core. For a decade, I have been in the position of counseling patience, insisting that the upfront investment in the quality of, data for, and access to primary care will eventually pay off. I truly believe that, with adequate resources to provide care management and care coordination, primary care practitioners and their staff can keep people healthier. The good news is that the tide is finally turning. 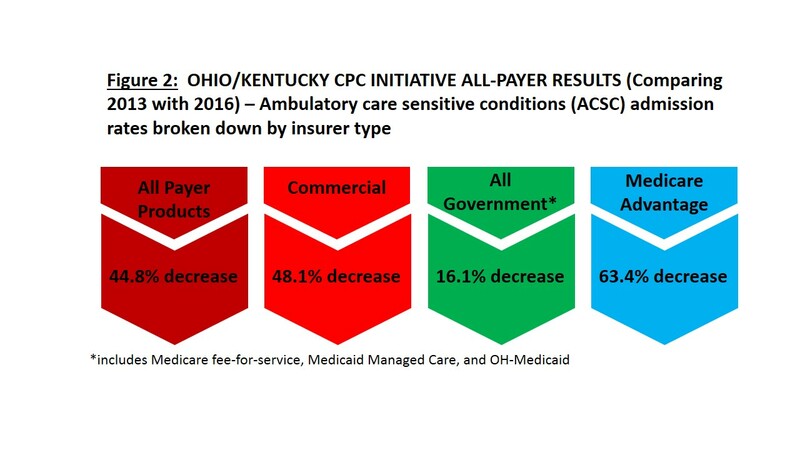 Primary care practices in Ohio and Kentucky are starting to produce the results I hoped to see. As participants in the Comprehensive Primary Care (CPC) Initiative—the largest scale and longest-running primary care transformation experiment in the United States (see Figure 3)—the Greater Cincinnati/Dayton Metropolitan Statistical Area (OH/KY CPC region) was able to show that their efforts have made impressive impacts in most of the insured CPC populations in their geographic region. 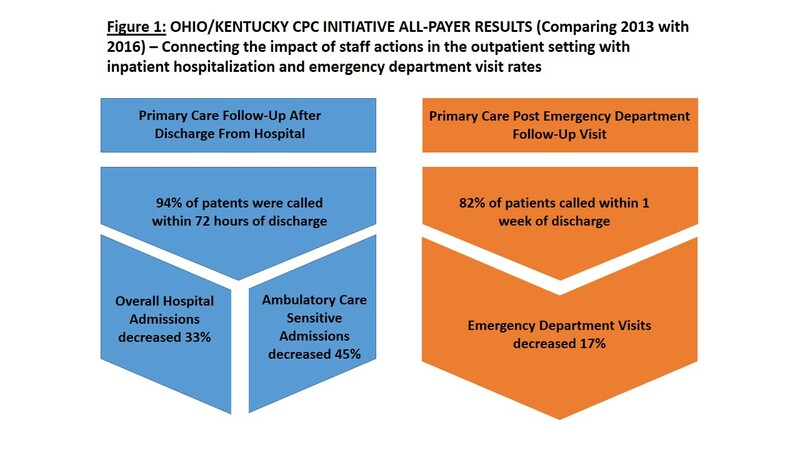 In 2016, the patient population in the OH/KY CPC practices had 17% fewer emergency room visits, 24% fewer specialist visits, 33% fewer hospital admissions, and a 9% reduction in total health care costs than at the beginning in 2013, before the CPC initiative. These numbers translate into considerable cost savings, even more notable at a time when overall health care expenditures continue to rise. The numbers are especially noteworthy because the recently released formal evaluation of the CPC didn’t find similar results—that’s because it only looked at the small slice of the population that the federal government was responsible for, specifically Medicare “fee-for-service” beneficiaries. Deborah Peikes and her colleagues published the findings of their precise and detailed assessment of the CPC over the last four years in Health Affairs in May 20181, concluding that the project “did not reduce Medicare spending enough to cover care management fees or appreciably improve physician experience.” For me, this was a big disappointment, as it was for hundreds of CPC participants. But then there was the encouraging information from Ohio and Kentucky. It comes from The Health Collaborative (THC), a statewide organization in Ohio that combines claims data collection and analysis from multiple payers and offers technical assistance to clinical practitioners. THC makes it possible for practices and payers to understand the complex information that is gathered, learn from others’ experiences, and use the data to improve the quality of care they deliver. THC collected and analyzed the claims data from all nine participating CPC payers, including Medicare, and were able to flesh out a fuller picture. Figure 1 illustrates several key findings from the THC analysis over the four year-long study period. The innovations that appear to contribute to decreases in expensive services, and therefore financial savings, are largely the responsibility of primary care practices, specifically when it comes to coordination of multiple aspects of non-medical care. For instance, THC looked at primary care follow-up after discharge from the hospital and post-emergency follow-up outpatient visits. They found that, on the whole, when patients were called within 72 hours of hospital discharge (which happened 92% of the time), subsequent overall hospital admissions decreased by 33% between 2013 and 2016. When patients were called within a week of an emergency department visit (which happened in 82% of cases), emergency department visits decreased by 17% between 2013 and 2016. This demonstrates that staff activities as commonsensical or as basic as phone contact follow-up after emergency room visits or inpatient hospital stays, or assigning a practice staff person to coordinate a complex patient’s multiple medical providers, made a measurable difference. Digging a little deeper, the reasons for THC’s notable results can be found by looking at ambulatory care sensitive condition (ACSC) admissions, where OH/KY found a deep decrease. ACSCs are admissions for patients who have one or more of about a dozen common chronic diseases such as diabetes, hypertension, congestive heart failure, and chronic obstructive pulmonary disease. These are “bread and butter” conditions, managed day-in and day-out by primary care providers (PCPs). Measuring what is observed in patients with ACSCs gets to the heart of what happens at the office or outpatient clinic when there is phone or email contact between a patient and his or her PCP—evidence of an ongoing relationship with frequent touch points. Any primary care physician will tell you that patients who experience good control of these conditions do so because the PCP goes way beyond the scope of a 10 to 15 minute office visit—and that care occurs with and because of persistent and proactive care management relationships with office staff, especially nurses. Taking care of patients in this way is not glamorous work, but it is very satisfying and appears to be essential to keeping unnecessary and expensive health care at bay; a good triple aim investment if there ever was one. Figure 2 illustrates these decreases in ACSCs by payer type. It also shows that THC confirmed CMS’ formal evaluation results: the CPC interventions had less impact on the Medicare fee-for-service population, although the reason for this is not clear. THC results, published in a Health Affairs blog2 by THC Medical Director Richard Shonk, MD, PhD, and Laura Sessums, MD, JD, former CPC director, highlight the extent and possible reasons for this discrepancy. Examination of multi-payer data and informal surveys of participating physicians and commercial health plans also provide insights for the strong support of this model. Richard Shonk and his colleagues explain their methodology and conclusions in greater detail on the THC website. We are at a watershed moment, on the leading edge of understanding the impacts of persistent dedication to process and care delivery improvement. While other CPC regions have not yet reported findings of this magnitude, there is reason to explore their years-long experiences. The Milbank Memorial Fund Multi-State Collaborative, of which the OH/KY CPC+ team of payers and THC staff are active members, continues to provide a forum for sharing best practices and lessons learned. We look forward to seeing more of the collection and analysis of information like THC’s to better understand the impact of similar activities underway in all 18 participating CPC+ regions. 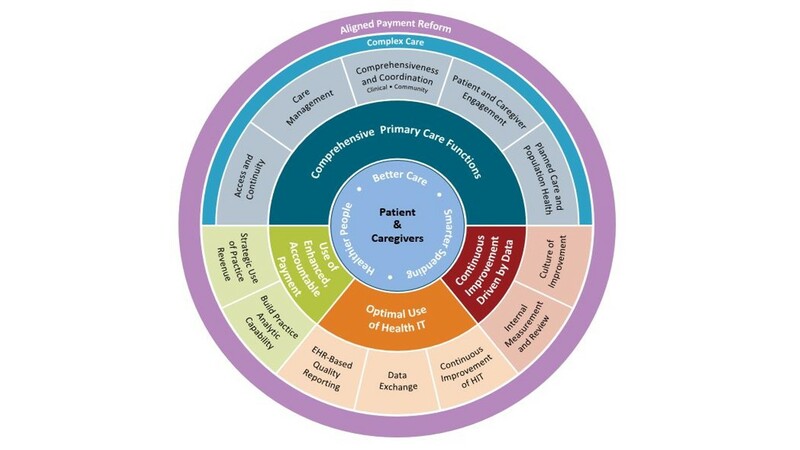 The Comprehensive Primary Care initiative (CPC)1, a program of the Center for Medicare and Medicaid Services (CMS) Innovation Center (CMMI), in place between 2012 and 2016, was at the time the largest and most far-reaching innovation ever, with active collaboration between 38 private and public payers, Medicare through CMS, and over 440 primary care practices in seven geographic regions. CMS and the other participating insurers financially supported five essential functions of comprehensive primary care, in grey on the graphic below. The goal of the CPC (and of its successor program, the Comprehensive Primary Care Plus, or CPC+1 was to improve care quality while stabilizing or decreasing unnecessary utilization of expensive health services, and ultimately associated costs. FIGURE 3: The graphic below was developed by CMMI. Activities in four domains surround the patient and caregiver. These activities support primary care practices in providing consistent and barrier-free access to high quality health care. Financial participation by multiple payers (the purple circle) in an aligned way makes the entire program possible. Lisa Dulsky Watkins is the director of the Milbank Memorial Fund Multi-State Collaborative, a consortium of 18 state and regional multi-payer programs designed to transform primary care. She is actively engaged in advocacy for new and continued support for these efforts and other innovations at the state and federal levels. 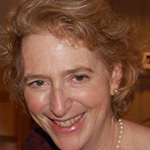 She is the former chief of operations for the Vermont Blueprint for Health, one of the founding members of the Collaborative. She received her MD degree from the Perelman School of Medicine at the University of Pennsylvania and her BS from the City College of New York. She completed her internship and residency in pediatrics at the University of Vermont College of Medicine and was in primary care practice as a board-certified pediatrician in Middlebury and Essex Junction, Vermont.